Like a few years ago, I worry about this team against athletic opponents (Minny, IU, etc). Saw it against NC State. Michigan's defense only works (not fouling, getting boards) when you have teams that will settle for shots. If you have opponents that attack the rim, you end up fouling a lot more frequently and giving up more OReb. Also, athletic teams rotate on defense better. So I think this M team can finesse with most teams in the country. I see them struggling against athletic teams, even if they're not elite. Also, think Ohio last year in the tourny. M would beat them this year, but they could run into a similar outfit later in the tourny who have more talent. Athletic teams with scoring capabilities (IU, OSU, Minny, Kansas, Louisville) really worry me. I didn't have anything else to contribute aside from that. Anything more substantial would have required some kind of research that I a) didn't know where to begin on and b) didn't care to do if I could figure it out. So to Twitter it went, where 355 people ignored it. But in the wake of the Ohio State game, it seems appropriate to revisit those concerns. Throughout this entire game, Michigan couldn't get near the basket. The much-hated long two-point shot became the team's go-to attack, not because they lost their composure--as story-driven announcers would have you believe--but because Michigan simply wasn't fast or strong enough to get into the lane. Nik Stauskas' disappearance comes hand-in-hand with this inability to get into the lane: as a spot-up shooter, he relies on drive-and-kick opportunities created by Trey Burke and others, but without a need to collapse on the lane, Stauskas becomes a non-factor. It may be safe to assume that Aaron Craft was the driving force behind this denial--when he exited the game late in the first half, Michigan went on a run that would carry over to the second half--but that's reductive. Not only did Craft frustrate the Michigan offense by harassing Burke, but OSU's rotation defense was simply faster than Michigan's offense, and when the ball was eventually dropped into the post to an unguarded big man, only Mitch McGary was able to convert (yet another instance of the increasing distance between his and Jordan Morgan's capabilities). The other place that Michigan's inferior athleticism appeared was on the glass, previously a point of dominance for Michigan. On the season, Michigan has rebounded 35% of their misses. Against OSU, that number was a mere 13% (snagging only 4 of their 29 misses). This brings us to the future of the team this season. Michigan has 6 more games against Big Ten opponents that I deem to be more athletic (the usual customers: Minny , Indiana , OSU , and Illinois ). The problem that Michigan faces is that the good teams in the Big Ten are specifically designed to beat the precision-focused offense of Beilein. While there's only so much a team can do to prepare for the complex schemes, having sheer athleticism that can recover from mistakes defensively is the greatest attribute when trying to beat a team that's built like Michigan (see Ohio in the Tournament last year). With three of those games coming on the road, Michigan is probably more likely to end up 2-5 or 3-4 against the Big Ten elite than it is to finish with a winning record. What people have been looking to for hope after this game was how poorly Michigan played in the first half, but OSU played nearly as badly in their second half, allowing Michigan to climb back into the game. While the common refrain is, "Well, Michigan played its worst basketball in the first half and still had a chance", OSU fans can nearly point to the same phenomenon in the second. But both of these arguments ignore the real takeaway from this game: there's probably a reason both teams played so poorly for 20 minutes. For Michigan, it was because the team was simply outmatched physically and struggled to get the looks they had previously. 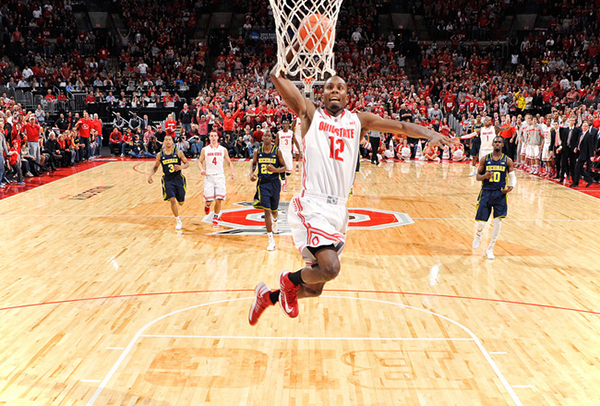 For OSU, it was because the shots that were falling in the first half weren't going down in the second. Ultimately those are a wash (see: 3-point margin of victory), but I'd probably rather go with the athletic superfreaks than the kids that rely on spot-up jumpers. There was a lot of speculation about why Sunday's game was actually a positive sign for Michigan, but I couldn't look past the glaring lack of athleticism that this team still offers. As the season goes on, how Michigan responds to athletic (but raw) teams will be something to keep an eye on, but this game was a stark reminder that Michigan still has a ways to go before they can hang with the nation's true elite. I really enjoy when you break down plays for football games and think you do a wonderful job of that. But otherwise I tend to find that you only post when you have something negative to say. That's human nature I suppose, but it gives me pause when I decide whether to click on my bookmark for your site. Michigan's team tied a record for the best start in the history of the program while playing a solid schedule not full of RPI-300 teams. Yet you only post something about basketball that's pretty negative. With that in mind, I think I see your general point in this post and I'm glad you attempted to back up that position with some data. However, a couple of things were missing from your analysis that would have helped to better confirm (or dispute) your conclusions. First of all, look at OSU's shot chart. You'll be somewhat surprised to find that it doesn't include many points inside either. And I have a problem concluding that the failure of OSU to hang with Michigan offensively in the second half was purely them missing easy shots without giving any credit to the Michigan defense. Second of all, if you're going to point the finger at Michigan's atleticism I would be curious to know who in particular is their biggest limitation. I agree that Stauskas isn't a slasher and relies somewhat on Burke to find him open for jump shots. But who else? Hardaway is an NBA prospect who's had a great year, GR3 can jump out of the building and has been dynamic athletically, Lavert barely played but is clearly fairly athletic if skinny, Burke is a POY candidate, and McGary was mentioned in your piece. So where is the limitation? I'll grant you youth, but it is hard to say athleticism like it used to be. As for McGary, I agree that he's a more dynamic player - but the post on UMHoops this week showed why Morgan is so valuable defensively despite his athletic limitations. Also, the defensive rebounding numbers for the game were heavily in Michigan's favor. My conclusion from the game was that Michigan had as many turnovers in the first 10 minutes as they usually have for an entire game. 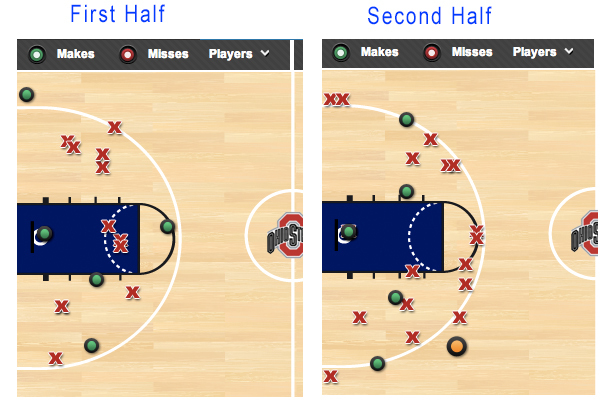 Almost all of those resulted in easy baskets for OSU either on the fast break or an open jump shot as Michigan couldn't get their defense set up. As soon as Michigan calmed down and cut out the turnovers they strangled the easy baskets out of OSU's arsenal and forced them to earn it. When that happened Michigan outscored OSU 47-30. I agree that there is probably some validity to your theory, but I think it is far from conclusive. I'm curious to hear what you think. On athleticism: Stauskas is an obvious issue (mostly defensively, where he's been lost all season). He lacks the speed to guard athletic 3s, but his offense is mostly independent of athleticism, so he's not a huge problem. However, people have always overestimated Hardaway's athleticism because he.... can dunk, I guess. His lateral movement is consistently a problem and he doesn't have the strength to get into the lane the way you'd hope a pure scoring guard could. Burke is athletic but got shut down by perhaps the best perimeter defender in the game. The degree to which he was stifled should throw up some red flags, however. You can praise Craft all you want, but even still, Burke is being considered a potential national player of the year. Those guys--when their primary attribute is their offense--should not be shut down quite so summarily. As for GR3, sure he's athletic, but like Hardaway, his lateral speed is quickly proving to be a problem. Taking the ball off the dribble, GR3 rarely gets into the lane past his defender. Jumping /= athleticism. He can go straight up with the ball when he gets it under the rim, but as one of the main points of this post spoke of: Michigan wasn't getting the ball inside in the first place. This Michigan team is a quietly unathletic team. I've been meaning to make a post about this for a while, but I worry about Burke's defense a lot more than most of the players on the team. This squad is basically incapable of defending teams one-on-one without switching (Stauskas and Hardaway are still well below average defenders, and GR3 is playing out of position). Their inability to stay in front of players and get through screens has been evident all season, but no more obviously than against NC State and OSU, teams that are built on the shoulders of athletic freaks. And as far as the turnovers are concerned, I think it's valuable to consider why those happened. Some will argue that it was just a young team losing their composure, but that's an easy storyline. If you watch the game, the team isn't throwing the ball away because they're frantic, they're doing so because they're getting caught in situations that they didn't normally against slower competition. As the season wears on, we'll have more data, but this is the kind of thing that I've been thinking about for a while now. Wisconsin, for example, is the kind of team that is clearly talented (that's how you beat IU on the road) but probably won't trouble Michigan as much as the OSU's of the world because they're just built differently. Unfortunately for Michigan, the majority of the good teams in the Big Ten are not built like Duke; they're built like OSU. Good response, thanks for sharing. I do think there are still limitations to the atleticism of this team, but it has come leaps and bounds from past years. Aside from Hardaway, most of the atleticism is with the younger players too - meaning that they should get better with conditioning and learning how to use that athleticism on the court. I love that they recruited Lavert instead of the freaky looking guy warming the bench for OSU because he is so atletic and can play multiple positions. With the recruits Beilein is getting you can tell that we'll continue to move up that curve somewhat. With that being said, I still like having a well rounded and well coached team that is a healthy mix of athletic freaks who still don't know how to use their skill as well as more savvy players with limited athleticism. MSU, OSU, and MN have had athletic teams for the past few years (with obvious success) but they also have struggled to score when they don't create points off of defense. How many articles have you read this year about MSU or OSU and their struggling offense? I also think you saw that happen once UM stopped throwing the ball directly to OSU players. Aside from Thomas, who can score for them? How does Matta even coach offense? Michigan had a bunch of good atletes in the late 1990s and they had no clue what they were doing on the court. I love that Beilein has coached us to the tournament without great players because when we get great players we'll have good coaching to go with it. I do agree that Michigan matches up better against teams like Wisconsin, but I think we need to see how much. I do worry about MN and I worry about IU (especially when they get 30 free throws at home). Finally, I can't comment on your lateral quickness comments since I don't know enough about basketball to have an informed opinion. Perhaps you're correct there. I will say that my limited knowledge of the game suggests that being able to switch on screens can often be an advantage. Since Burke, Hardaway, GR3, and Stauskas are all similar size and skill they gain an advantage of not having to fight through every screen. If we ever played a team that had two bigs on the floor you could get burned by this, but that's pretty rare. There were two situations in the OSU game where they ended up with a mismatch, but that might still be better than losing your man a few times per game fighting through a screen. One more thought on this game. My brother asked me if I was "over it" the next day. It made me put the game in perspective. On the one hand, if you looked at the final boxscore and knew we lost by 3 on the road while having everyone struggle shooting the ball and not getting a single call (Burke not getting the and-one on the fast break in a horrible call, Hardaway getting hacked going to the hoop and getting no call, two three point shots being affected by contact without a call, the OSU players hooking everyone in the paint, etc.) you'd probably think of it as-expected (as did KenPom). On the other hand, if you watched Michigan get blitzed for ten minutes like Brian Ellerbe was coaching the team you'd think that there are some major issues on this team that need to get fixed and the fight to get back in the game was nice but was probably more like getting passing yards against a prevent-defense. I fall somewhere in the middle and will reserve judgment until I see how the team reacts to this experience. The fact that their next game is also on the road against a tough athletic team gives us a chance to see how they respond. What do you say now, Mr. Negative??? Michigan just ran Minny out of their own gym with their alley-ooping, 360-dunking ATHLETICISM!! Do us all a favor and find another team to cheer for.